Our school was built in 1940 and has a lot of charm…but also some inconveniences. One of the biggest is the chalkboards. I have two huuuuge, long chalkboards in my classroom. This is just part of one chalkboard that runs along the wall near the entrance (please excuse the mess, I am cleaning up in between workshops this week). The schoolteacher in me thinks the chalkboards are cool and they are kind of antique-y. But the realist in me knows that I need whiteboards for the computer projector…plus they’re just cleaner. 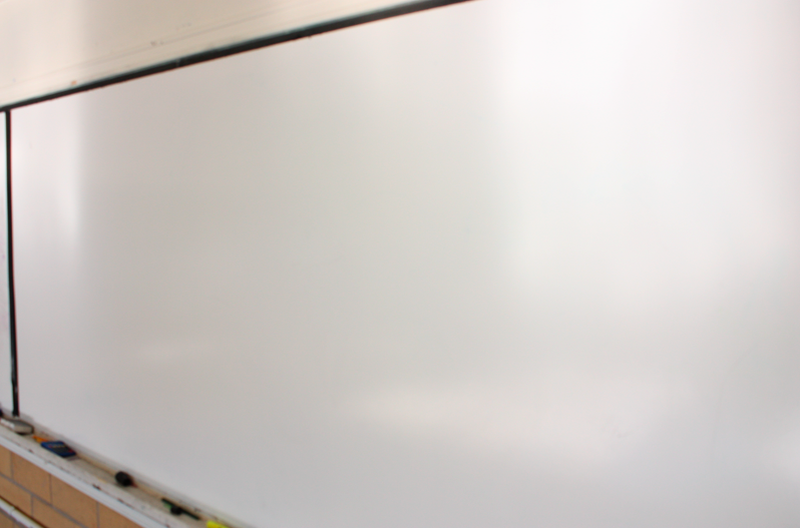 Thanks to the wonderful teachers over at Proteacher, I learned that you can get huge sheets of showerboard at Lowe’s or Home Depot–and they work just great for whiteboards! They are sooo cheap too, like $12 a piece (I think). I use a Magic Eraser to erase them and it takes the marker off really easily. A vinegar and water mix cleans them up nicely as well. And (as if it couldn’t get any better) they aren’t hard to install…Velcro holds them securely all year! I know many teachers know this already, but I thought I would share…just in case. Showerboards have really helped transform my classroom and teaching. I’ve been using them for years now and they are fantastic! Do you have chalkboards or whiteboards? Or showerboards?? I have been deliberating on buying a large showerboard to divide into smaller student whiteboards. Our class sizes are going up and I only have a set of 21. I love individual student whiteboards for whole group and guided reading activities. But, like you said, the edges are a concern. That really is a great idea, did you ever decide to do it? I remember seeing a teacher teach using those little whiteboards, it was truly magical when she used them in class. I used shower board for my kids to each have their own personal white boards other than buying the expensive ones. I just had Lowes cut it down to size which totaled to be maybe $14 dollars in all. 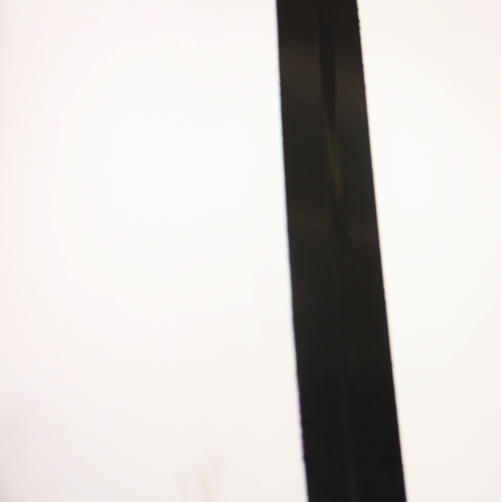 And You say electrical tape….I snazzed it up and did different colored duct tape to protect the edges! I love the extra pop of color it adds and so do my students! I bought another piece and had it cut down into four and I use this during guided reading and math. I just lay it on the table so that all the kids can see and sometimes write on it, so that each one does not have to bring their white board with them! 🙂 Hope you are enjoying your summer! I have a rolling whiteboard with 4 massive panels. I use it as my daily task board (with coloured electrical tape separating the sections). I have a smartboard for my actual teaching… but the direct sunlight can be a bit of a pain. Thank you so much for sharing this! I had no idea you could do this. 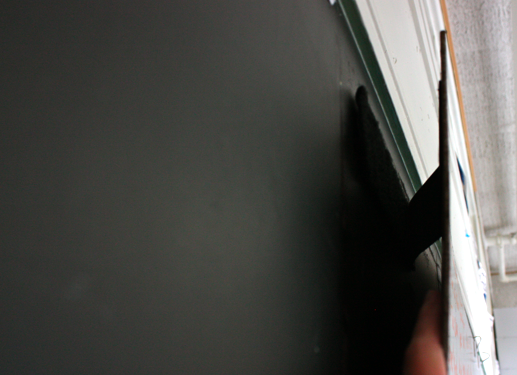 Parts of my classroom still have green chalkboard that is barely useable. This is a fabulous idea! I have an old one in my classroom. Crayola dry erase markers worked the best on mine. They erased so very nicely! Hi Jess! I missed that completely, I feel silly for posting this now!! I can't wait to be out of school so I don't miss posts!!! Showerboard can be cut into any size that you want (Lowes and Home Depot does this with either no charge or very little charge) I have used duck tape in 3 colors – red, blue and black. I can pass out the different colors and then group them by teams. Last year our math resource teacher had them cut to size for the rectangle tables- instant white boards. If you use perm. marker on the boards you can create graphic organizers, number lines etc. You can also create specific center activities by doing this and having showerboard in different locations around the room -on backs of bookshelves or between 2 bookshelves as well. Also, if you drill a hole in the corner of each whiteboard and use a book ring you can attach a sock (eraser) and insert a marker to have ready to go. I might have to look into that for next year! Right now my chalk boards are used as bulletin boards because I HATE chalk! In the classroom I'll have, I have one whole wall of whiteboard and then one almost-whole wall of chalkboard (except for the doors to the coatroom). When I observed the retiring teacher whose job I'm taking, I saw that she really didn't use the chalkboard except to magnet random papers onto it. I think I'll use it as a word wall though! I love the idea of having the store cut it down into individual whiteboards. I only have little chalkboards in my room. I think I will try out the chalkboards and if they are not working very well, I might run and get some showerboard. Thanks so much for the great idea!! I have used these in the past but I have to say a big thanks for telling us a cheap way to clean them. Thanks so much! I have used showerboard for about 8 years now and am just this summer replacing my 1st set- not becuase it doesn't work anymore, but because it is getting quite stained. I also have mine cut into individual boards (approx 12×12) but in addition, I did little boards that fit inside of their pencil boxes. Now that I have tables they fit easily into our caddies. These are my "mini math boards" and come in quite handy when wanting kids to do a quick think and show problem not to mention they are easily accessible. I have 'showerboards' and I use fingernail polish remover to clean. I am also in an old school and I had BLACKBOARDS on 3 of the 4 walls…my room was once a high school room. I had my blackboards covered with bulletin board material. Kristen – Isn't it great. We already have whiteboards in our school, but when I got my class this past fall I went to Lowes, bought a sheet and had them cut it then and there for me. It made enough for me to put plenty at word work, and still have enough to use elsewhere. I also use the electrical tape to divide the board into sections for different subjects or make a little chart if I need to. I know you are looking forward to the end of school. You're almost there. Such a good thing to know! I will keep this in mind when I finally get my own room! One thing you could do is buy a $12 sheet of melamine and back it with something called flex iron. This would turn a melamine style whiteboard into a magnetic whiteboard at a cheaper cost than buying a porcelain-on-steel board. I am trying to find the flex iron. When I do, I will let you know where to find it. This will make the board magnetic. I forgot to comment on your question. I have 1 chalk board that I cover for my word wall and the other is a white board. However, when I come back to the building after renovation we will all have white boards. Another quick fix for the stained boards is hand-sanitizer. My kids are used to using it appropriately for safety, but then they can put a squirt on a tissue and wipe the boards clean. My old marker-stained board comes clean every time! I did the same thing! I loved my showerboards! I had them cut into 12×12 pieces so each of my students have an individual one, too. Is there another name for "Showerboard"? When I looked online at Lowes.com and HomeDepot.com and put in Showerboard (and even as two words) it said nothing found. I'll get over there eventually to find out but thought there was another name for it. I teach at a daycare center and would love to use Smartboard ideas about things I want to teach during my thematic lessons. Thank you for sharing this wonderful and creative idea. I can now use technology in my daycare classroom and really impress my new boss. Just finished my 26 th yr teaching. Have used shower board as individual boards and have a piece on the back of a bookcase that I use as a divider, we do our calendar time at this board. Have a piece on the back of my door we use for scheduling and such. I am self contained sped with three assistants. My son will have his first teaching job in august…so proud! I am making him a back to school basket and I have had 30 individual boardsmcut for him to use. Gave him colored duct tape to finish off the edges. a lot cheaper than Plexiglass, which is what I WAS going to buy for our homeschool. Now, thanks to your tip, I will be saving even more money by just doing this easy project. I save my dryer sheets (and so do many of my students) after a load in the dryer. We use those as erasers on their individual showerboards. When they are full of color, we throw them out and they get a fresh one. The kids love saving and reusing their dryer sheets – and the room smells good, too! What kind of velcro did you use to adhere it to the chalkboard? I can't wait to do this in my classroom! 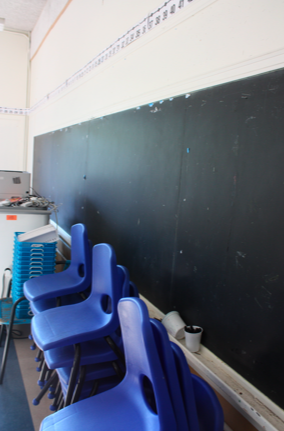 Good bye old, scratchy, dusty chalkboards! I can NOT thank you enough for this info! I am moving into a new room this year and it has only chalkboards. I was planning on buying portable white boards (2ft for $20) and using those. I want to jump through the computer and hug you! I LOVE, LOVE, LOVE your site! I need something like this but magnetic. Any ideas! Home Depot sells this as "panel board". When I asked for white board or dry erase, I was directed to the 2' x 4' dry erase boards for $10. Not a bad deal, but I wanted the large sheets (4' x 8'). I'm in Portland, OR, and they are currently $13.45 for a 4' x 8' sheet. They will cut it for free at my store. I am planning on making mine magnetic by using Liquid Nails to attach sheets of thin and light sheet metal to the back. Haven't decided how I'll attach yet, but am now considering the velcro! Sherrill, I am thinking about do this as well. I'm just worried about not having any magnetic space. Did the sheet metal work for you?